The 45-day cycle nailed the low to the precise day. What happens next is critical. 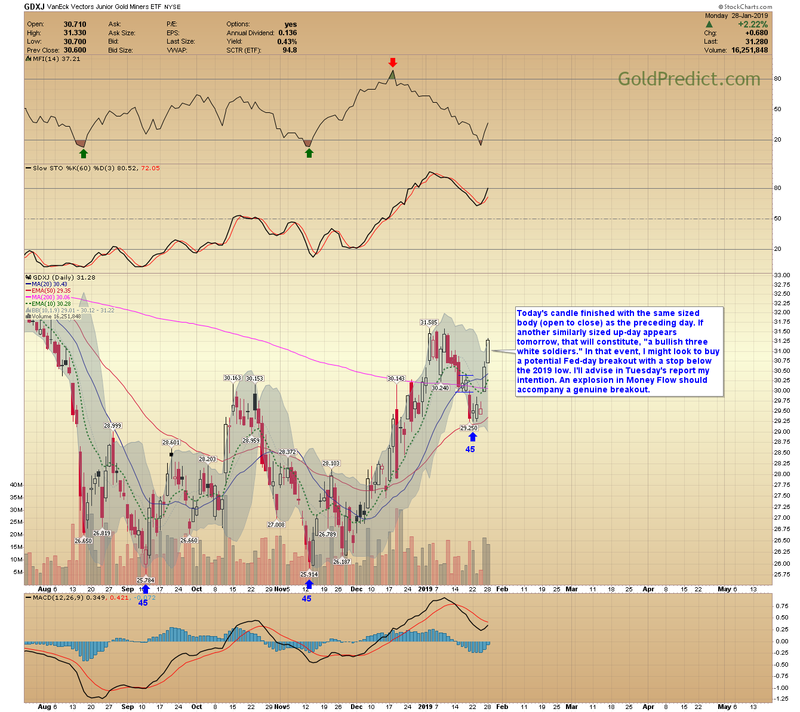 I listed the bearish possibility this afternoon. Below is the bullish chance…should the Fed announce something on Wednesday that immediately displaces sentiment. -GDXJ- Today’s candle finished with the same sized body (open to close) as the preceding day. If another similarly sized up-day appears tomorrow, that will constitute, “a bullish three white soldiers.” In that event, I might look to buy a potential Fed-day breakout with a stop below the 2019 low. I’ll advise in Tuesday’s report my intention. An explosion in Money Flow should accompany a genuine breakout.